The South side of Watertown is home to the city's middle, junior, and senior high schools, its hospital, numberous car dealerships and doctor's offices, and many beautiful neighborhoods. But it's never been a great place to eat. Sure, there's a Jreck Subs. For awhile, a Pizza Hut and a Baskin Robbins took up some space. Way back when I was a kid, the diner inside the Kmart on Outer Washington Street kept busy, and Shelly's Deli did a brisk business for many years just a few doors down from that property. I'm thrilled that Ives Hill Country Club provides a fine dining and lounge setting on this side of town, but a few more casual options have been sorely missing for years. With all of those professional people, close restaurants open for lunch were especially lacking. 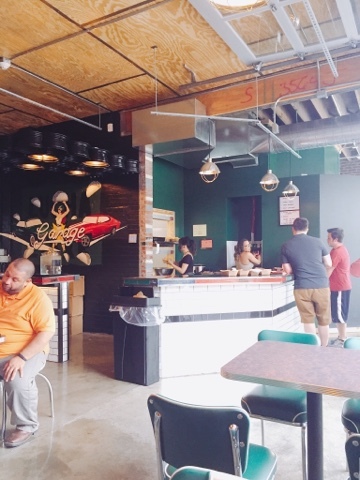 Like magic, PieZano's Pizza showed up just a couple months ago in the Tops Plaza. And there was much rejoicing in the land! I've sampled PieZano's menu on three separate occasions, and I've been waiting excitedly to share my thoughts about this new gem with you all. Our first visit, we shared a whole veggie pizza, and were immediately impressed by the tasty, chewy, golden crust - not cracker thin or Sicilian, but somewhere in between. It was hearty, flavorful, cooked at high enough heat to render the bottom crunchy, but balanced with the plentiful toppings. 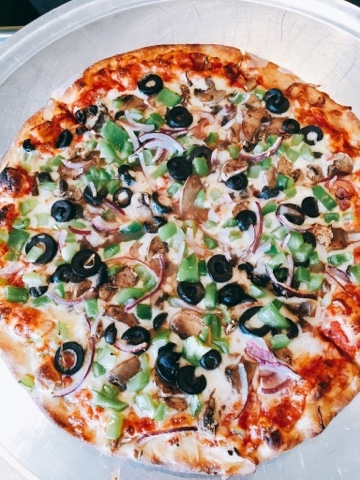 The vegetables were impeccably fresh, peppers still crunchy, mushrooms hand cut instead of from a can, and thin shards of red onion for sweetness sharing space with black olive slices for depth. The sauce at PieZano's is sweet and bright, and the cheese has good pull and that creamy, almost salty taste of quality aged mozzarella. 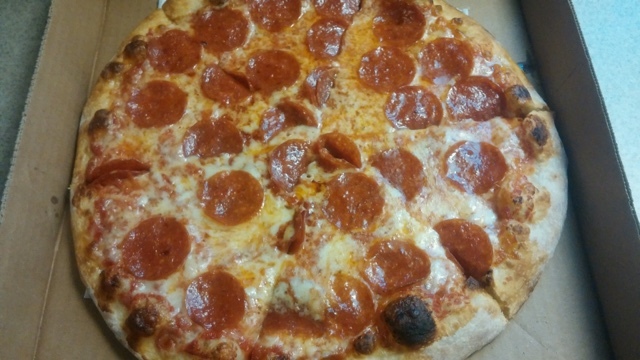 The second time, we got a pepperoni pie and brought it home, to see if it would get soggy during transport. Fear not! That toothsome crust had appealing, caramelized blisters around the edges, and remained a crisp base for the spicy, greasy pepperoni. It might seem odd that I'm describing the pepperoni - we all know what pepperoni tastes like, right? But I can't tell you how many times I've had slices of cheaper pepperoni without that telltale bite, the mild-but-exciting zing of Italian chile flakes that seem to be missing from bargain brands of this sausage. I only use Margherita brand or better at home, and I was pleased that PieZano's pepperoni - America's most popular pizza topping - was worthy. This is not NY style or Chicgo style or gourmet pizza, but it's exactly what you might want to order on a Friday night after a long workweek: hearty, flavorful, simple, and delicious. Our next visit, we dined in. 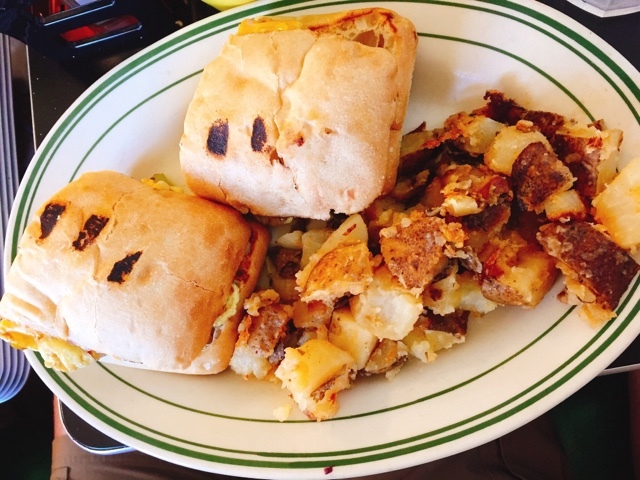 PieZano's has a small dining room, but are not especially set up to accommodate eat-in customers. 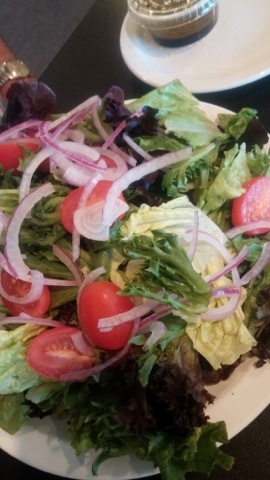 The flatware is plastic, and the salad we ordered was already packaged in a plastic to-go clamshell and had to be dished out onto a plate for us. Dressings are from little packets. 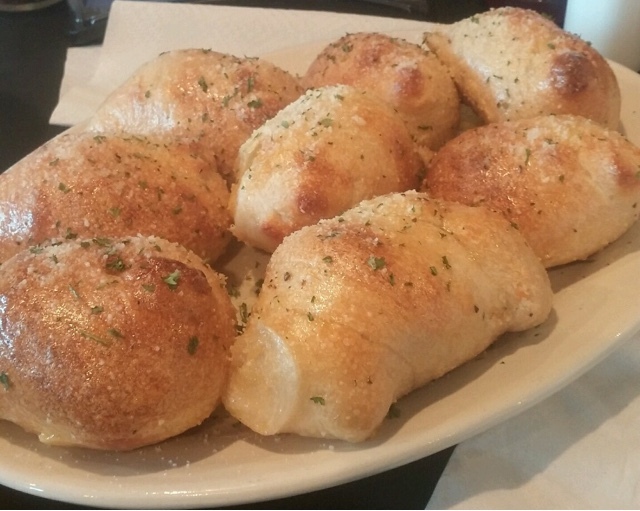 The garlic knots here are large and fluffy, with a lightly crisp exterior. They weren't drowning in garlic butter, like other local knots. They had garlic salt on top rather than fresh, minced garlic, so the effect was much different than most sloppy, super garlicky rolls, more like garlic bread made with pizza dough. The vegetable beef soup, I didn't think was scratch made, but the menu asserts that PieZano's makes its soups in-house. It was very flavorful, bordering on salty, with big chunks of potato, green beans, peas and soft beef. 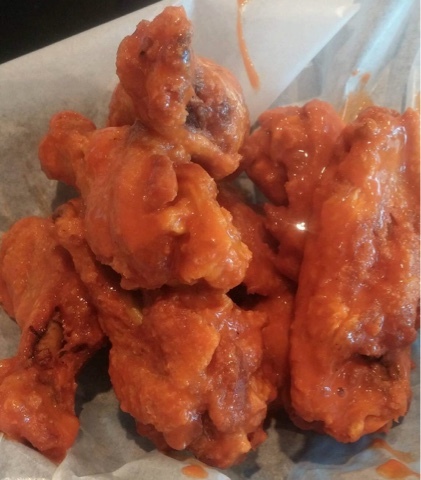 Medium chicken wings were coated in a bottled buffalo sauce, I believe, as it was more viscous than a simple butter and hot sauce combo would render. They were cooked perfectly crispy for my tastes. Dipping sauce and celery and carrots are extra, as is the trend these days. No gratis accoutrements, a la Wing Wagon. My suggestion would be to raise the price 50 cents and include blue cheese and celery. 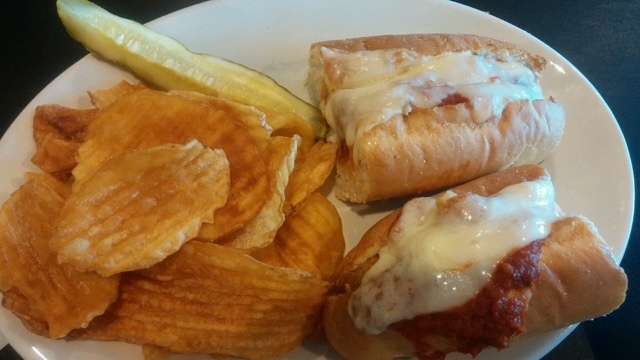 The chicken parmesan grinder was lighter than I expected, dressed with a sauce smacking of fresh tomato brightness and lots of gooey provolone cheese on a light, airy bread. The fried chicken breast itself was standard, and didn't add much flavor to the overall works. 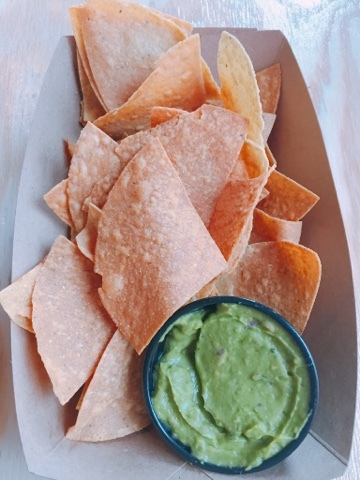 Chips on the side were house-made, crinkle cut. Not greasy but aggressively salty. 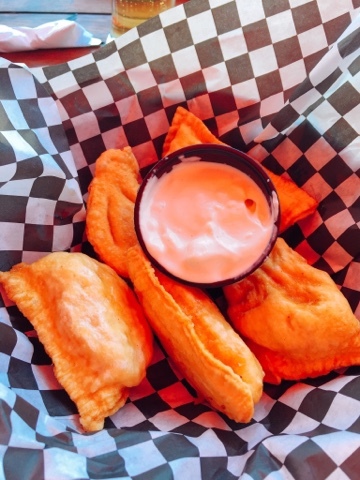 Order an extra cup of water for these babies, because PieZano's doesn't serve beer to wash them down with. 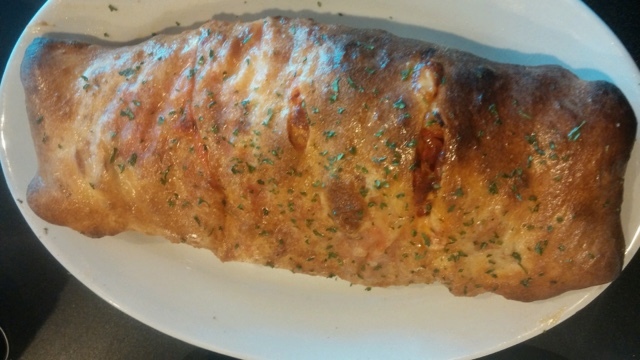 Stromboli with pepperoni and mushrooms was massive and absolutely delicious, as were its leftovers the next day. It was a hair on the greasy side, but not in an off-putting way. Again, the ingredients stuffed inside were high quality and flavorful, the sweetness of the sauce offsetting the earthy mushrooms and spicy pepperoni. 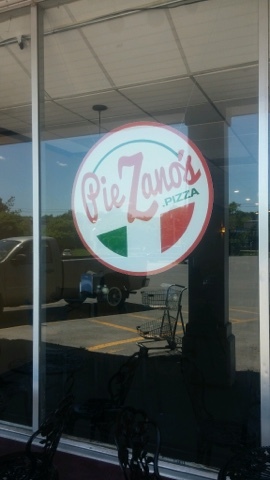 We tried two individual slices, a red and a white, which are available in addition to whole pizzas at PieZano's. They couldn't hold a candle to the whole pies, their flavor muted by too long a slumber at room temp, and the crust was dried out. My advice: skip 'em. 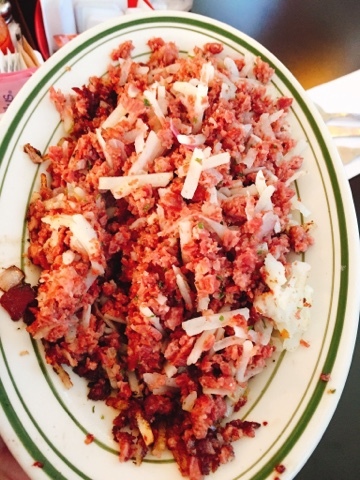 There are flashes of brilliance on the menu at PieZano's, along with some items that fell short, for us. I should note that they offer gluten free pizza, in addition to my preferred glutinous extravaganza, so for those our you looking out for such things, now you know. I give PieZano's a seven on the BHS scale - an overall great addition to this side of Watertown, with mostly terrific eats. While the pizza can't beat Stefano's or Art's Jug, for me, it is something I've been happy to tuck into on several occasions. With a side of crispy wings and some of those massive garlic knots, you can sail away into your carb coma blissfully after a meal here. Mangia! My personality is big; my hunger is bigger! A night out in the Bay is not something I’ve indulged in some time. 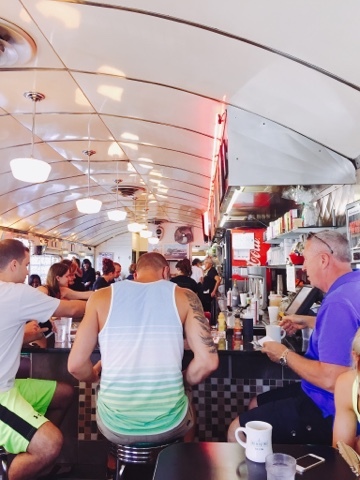 There were many, in my 20s, when Skiffs Bar seemed a world away from Watertown, a place to meet people from all over the country and occasionally, a teacher I knew from high school. These days, though, Alexandria Bay can sometimes feel overly glaring for a more seasoned gal such as me. The touristy atmosphere and continual bustle sit in contrast to peaceful Clayton, which is more my style, generally speaking. So I’ve been looking for the perfect dinner spot to write about in Alex Bay – to recapture the attraction I felt to this village in my younger days. 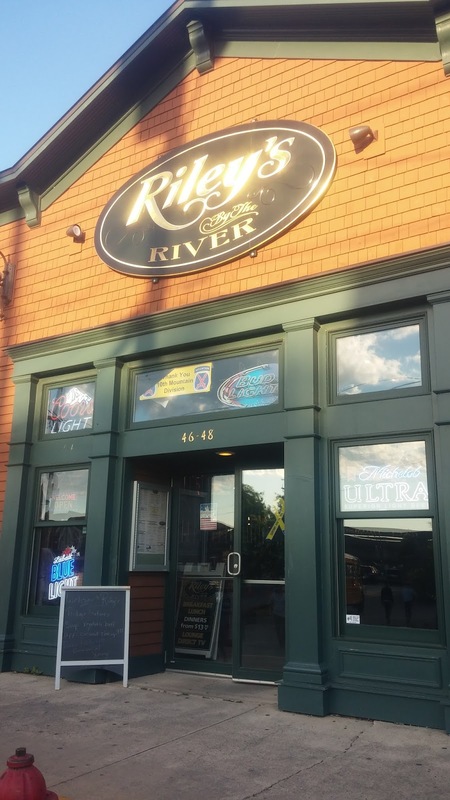 Recently, we tried out Riley’s by the River to see how it fit. Riley’s sits directly on James Street, front and center to all the action in Alexandria Bay, and across from Captain Thompson’s floating empire, which used to have its own restaurant, and which is owned by the same family. 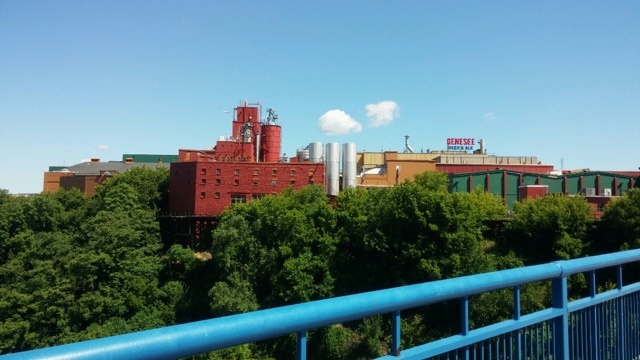 You can see the river from the windows dominating one wall of the dining room, and Uncle Sam Boat Tours’ launch space, which also is owned by the Riley’s family. 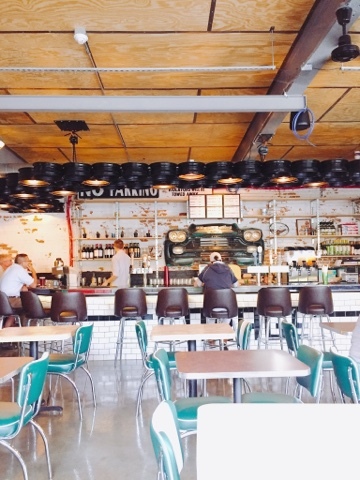 What’s not made up of windows inside Riley’s is all attractive dark wood and coffered ceilings – its innate elegance made more casual by bistro and pop culture-themed décor. A diner would be comfortable here either in a sundress or shorts and a t-shirt – the ambiance dictated by whoever happens to be eating, whether couples or families. When people are in the Bay, they’re mostly on vacation, and that easy feeling is reflected here. 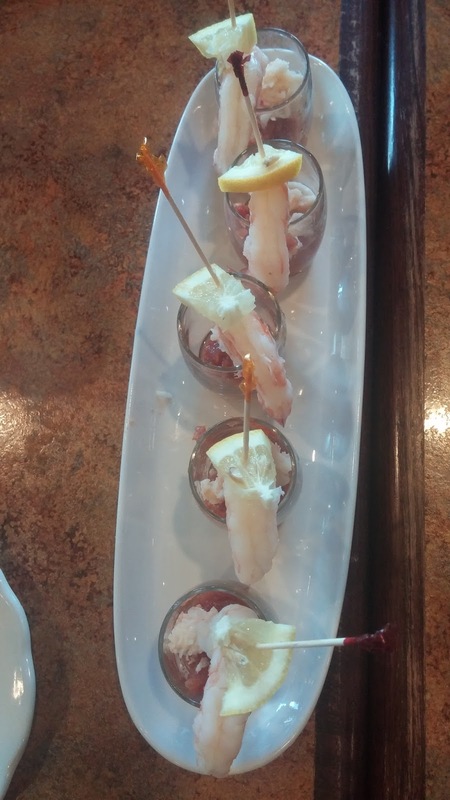 We were impressed right away by the presentation of the shrimp cocktail ($10.99): five shot glasses lined on a white platter, layered with house made cocktail sauce, large, succulent steamed shrimp, a bite of lobster meat, and a slice of lemon. The cocktail sauce tasted tangy and fresh – unlike the somewhat stale flavor the stuff in the jar can have. The small bit of lobster topping each shrimp added sweetness to the overall flavor, and having a slice of lemon for each serving meant you never ran short of that hit of sharp citrus essence which so well pairs with fresh shellfish. Loaded potato chips ($8.99) were every bit as junky and decadent as the shrimp cocktail was refined and modern, to our glee. Homemade crinkle cut fried potato chips formed the base of this dish, served on an old school sizzle platter. Perfectly cooked, tender and juicy pulled pork topped the chips, but unfortunately, there’s wasn’t much of it. 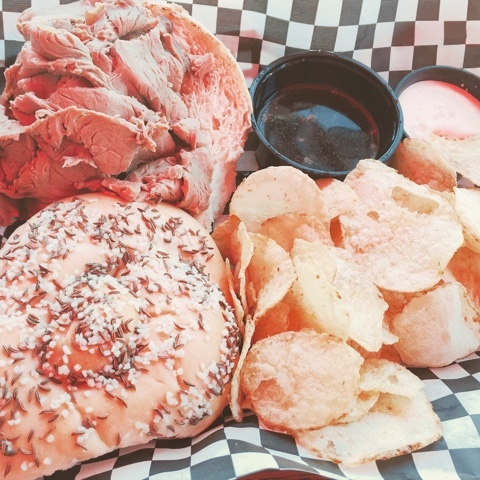 I had to actively hunt for some to sample in order to take notes on its flavor, because there was so little of it – certainly not enough on the platter, as a whole, to have a bite of pork with each chip. 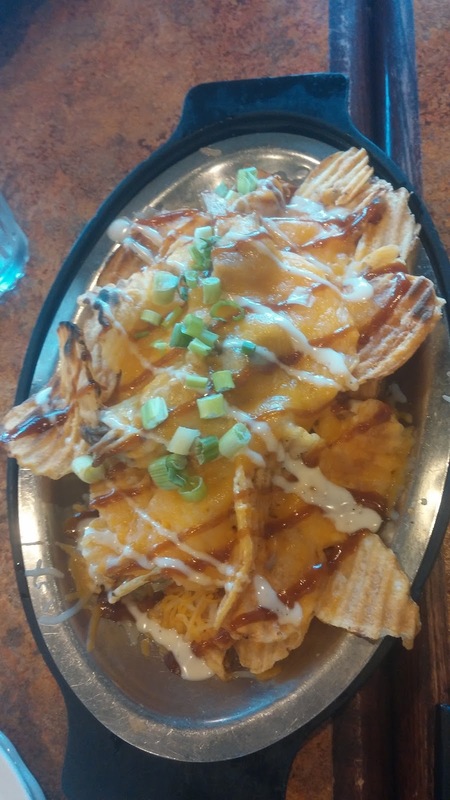 Cheddar cheese covered the chips, with scant drizzles of both BBQ sauce and ranch dressing. I was pleased with the ranch, as the cool, herbal flavor served to counter the aggressive sweetness BBQ can often bring to the party, but honestly, again, there was so little of both these sauces, most of the balancing was unnecessary. Mostly, this dish was melted cheese-covered chips – savory, crisp, but with much less BBQ flavor than we expected when we ordered it. Our waitress was fun, joking and entertaining us, and we enjoyed her so much, we didn’t realize for a while that she was doing a lot more socializing than she was actually waiting on our table. Our dirty appetizer plates sat in in a pile in the middle of our table for the duration of the entrée course. The vegetable Panini ($10.99) came dressed with one of my favorite ingredients: goat cheese. Have you tried it? First off, it’s tangy – with loads of flavor and personality but none of the salinity you get from feta. Secondly, it’s creamy – you can use it almost as a spread, to add moisture without the fatty, bland mouth feel of mayonnaise. It’s a brilliant sandwich cheese, honestly, and when paired with grilled vegetables, you get a wonderful combination of sweetness, earthy dimension, piquancy and richness. The toasty flatbread anchored the sandwich with charred flavor that just contributed more to the delight of eating this treat. 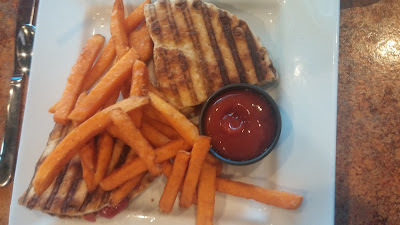 The sweet potato fries served alongside were not such a delight. These originated from the freezer, if I’m not mistaken, and were lacking the earthy sweetness and caramelized depth you usually get from a homemade sweet potato French fry. They were bland and undercooked. 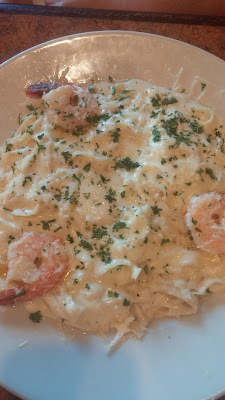 Fettucine alfredo with shrimp ($20.99) was overall, fairly tasty, but I’m sad to report: the pasta was overcooked by a good bit, so the overall chew factor was gummy. The sauce was rich with cream but underwhelming when it came to the authentic, nutty aged flavor of real parmesan cheese. And for $21, only three shrimp were topping this massive bowl of pasta. 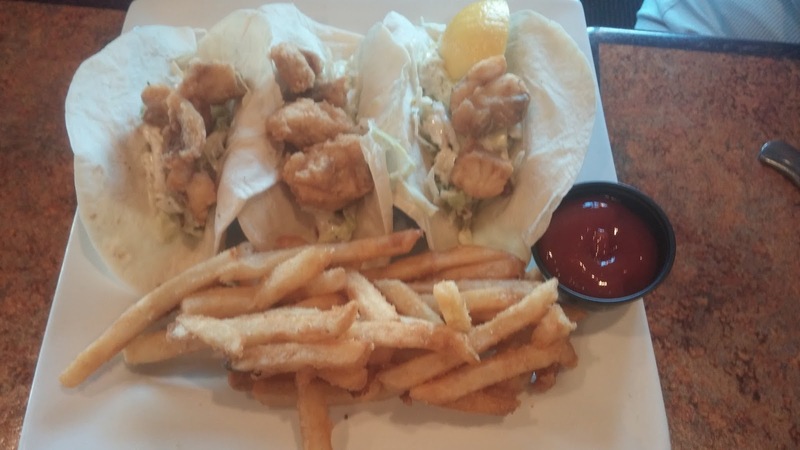 Now, shrimp are what they call a loss leader in the restaurant business – people love to order this sweet seafood, but there’s typically no profit to the enterprise when they sell them, because the wholesale product is expensive and consumers typically won’t tolerate much mark-up. So skimping on portion size is not unusual for this product. Conversely, pasta and cream are cheap, and since there was almost no real cheese flavor going on in this dish, I would suggest the price tag could have withstood a couple more crustaceans. Even the diner who ordered this, one of the easiest to please in my crew, was disappointed with how few shrimp were in her dinner. I don’t blame her. For $21, you needed to bring it with either great parmesan flavor or lots of shellfish, and this dish delivered neither. 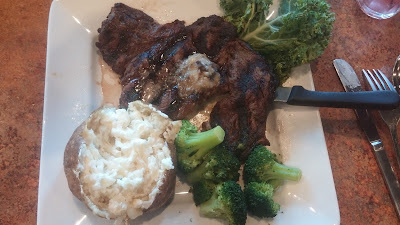 The delmonico steak ($26.99) was sunk before it even got sailing, because while the menu at Riley’s brags that all the steaks are cut in-house, this thing was about a third of an inch thick – way too thin for this cut of meat. It was grievously overcooked from the requested medium, grisly and tough. What a shame that this typically rich, juicy protein was (forgive the pun) butchered so terribly. I was excited for the mushroom compound butter served on top, but it had little seasoning, and couldn’t save the rubbery, bland protein upon which it was perched. To further add insult, while the steamed broccoli florets were wonderfully fresh and cooked perfectly crisp-tender, there were only six small ones served with this $27 plate. The small baked potato was fine, but delivered with very little butter to fix it up. Since no bread course came with our meal, there was no extra on the table to steal for the spud. A bigger portion size ruled the chicken parmesan ($16.99), which was anchored by a thick, ungainly fried breast, rather than a pounded cutlet. It was under-seasoned, and therefore tasted more like fried breading than anything else. A bright, loose tomato sauce seasoned with dried Italian seasoning coated a mountain of spaghetti surrounding the chicken. This was a huge pile of really uninspiring food, to me. As in, I was not inspired to eat more than a single bite of it. 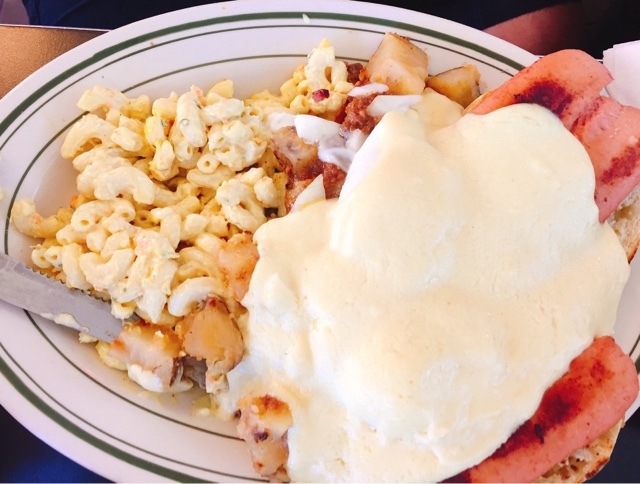 It all lacked the hallmarks of a classically authentic Italian-American red-sauce dish – the slow-cooked tomato gravy flavored with aromatic vegetables, garlic and fresh herbs, juicy, flash-fried protein, and aged cheese. This brought to mind a dish comprised of canned, jarred ingredients thrown together because chicken parmesan is a required item on north country menus, rather than a family recipe handed down through the generations. 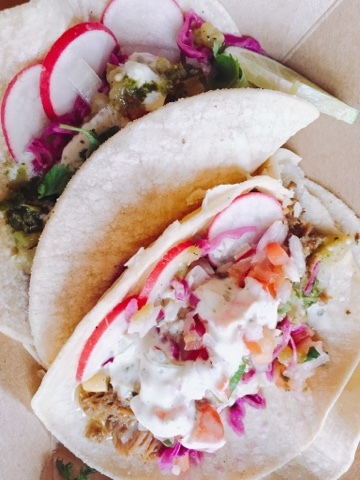 Regrettably, things did not perk up with the fish tacos ($11.99). The crunchy fried cod nuggets nestled in these three flour tortillas were utterly flavorless. The lime slaw in there with them had a hint of personality, but not enough to save the white fish blandness. And rather than serve them with some salsa, a flavored crema, some pickled chile peppers, or any other kind of south of the border accoutrements, these came with a side of fries and ketchup. Look, please don’t attempt Mexican food, or even Tex-Mex, if you can’t deliver on a single of its telltale flavors or ingredients, OK? Let’s agree to a pact on that. In fact, don’t attempt any ethnic cuisine if you aren’t familiar enough with its tenants to comprise a dish that makes sense. 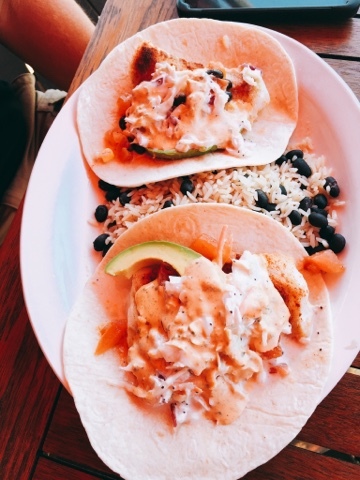 In San Diego, where fish tacos are king, the fish pieces would have been dressed with lime juice and salt immediately after leaving the fryer, then finished with crunchy cabbage, a white sauce perked up with ancho chile powder and maybe some avocado puree, and a fresh lime wedge alongside. 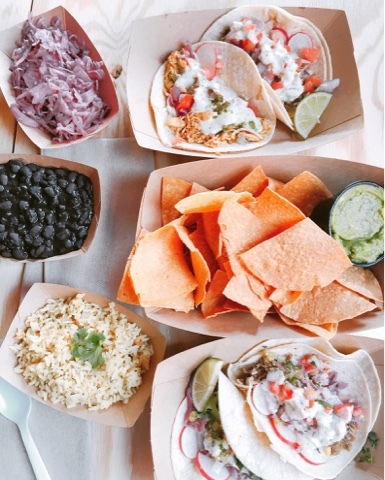 Each taco would be topped with fresh cilantro. You need those verdant, strong ingredients to bring the fish to life. Otherwise, you’re stuck with what we got at Riley’s: a tasteless mouthful of flour tortilla with mild, plain fish and a tiny blip of sour citrus. No thank you. Oooo-kay, let me step off my culinary soapbox. That was very preachy. I apologize. Apparently, I have big thoughts about chicken parm and fish tacos that I needed to work out. But you understand where I’m coming from, I hope? Even in a tourist town, you expect that if a dish is on a menu, there’s going to be some level of competence in its preparation. These two dishes illustrated that a lot of food is being served here just to make money rather than to really cater to the customer. If you’re going to be a professional cook, you’d better be able to actually execute the cuisine your kitchen promises to crank out. Or you’re not living up to your end of the bargain the diners make. We plunged forward into dessert, even though, with the exception of the Panini, we had been really disappointed by the entrees. 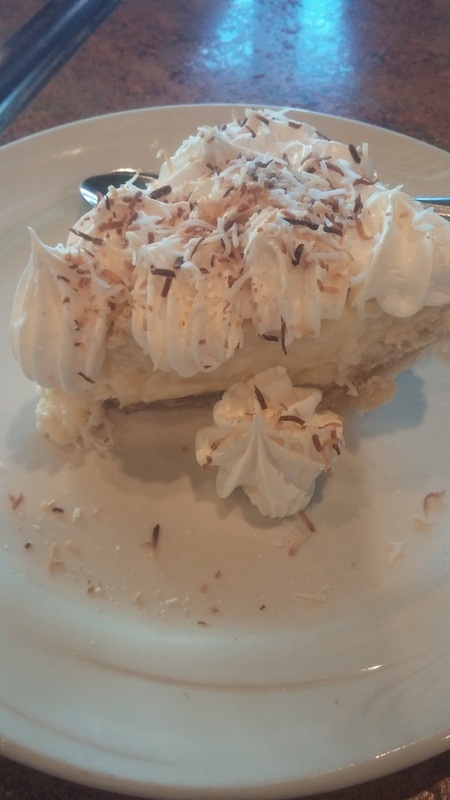 The coconut cream pie ($6.99) was homemade, and the stand out of the course. 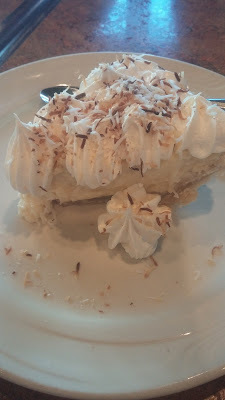 The pastry cream actually tasted like coconut and vanilla and wasn’t too sweet. The crust was a little blonde for me – I like a crunchier, darker and more developed flavor, but this was still a creamy, yummy dessert. 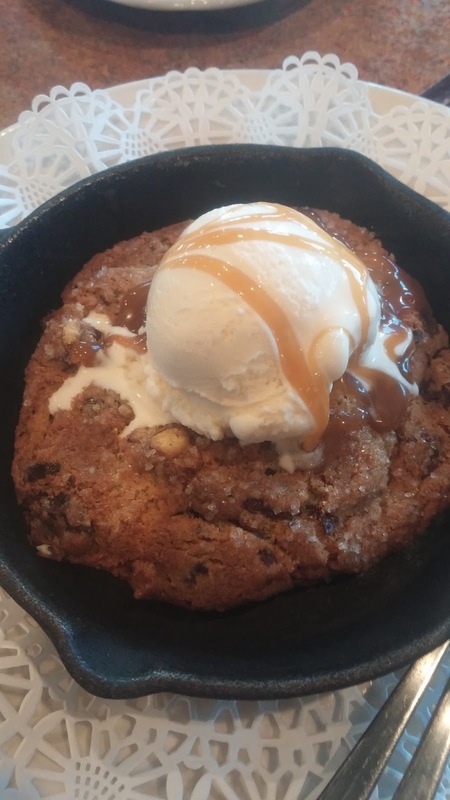 The skillet cookie ($6.99) oddly, was not cookie dough baked in a cast iron skillet, but instead a cookie placed in a skillet and warmed up. Now, a warm chocolate chip cookie is always better than a cold one, or no cookie at all for that matter, so I guess I can credit that; but to me, the whole point of the skillet is for the cookie to be caramelized and crunchy at the edges and warm and gooey in the center, which this was not, at all. 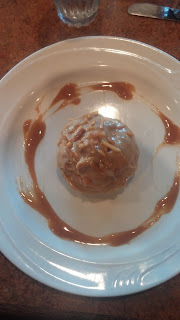 The whole thing was crisped through, and even the melting vanilla ice cream and caramel sauce over top couldn’t save it. We had been anticipating the salted caramel vanilla cream puff ($6.99) through the whole meal, because how good does that sound? But this was another creamy, but ultimately bland dish. Even the salted caramel failed to taste like anything at all. Where was the salt? The cream puff was denser than the word puff implies, and whatever filled it was unidentifiable, flat, flavorless goo. If you remember way back to the shrimp cocktail, we had high hopes for this meal. That dish was creative, well-executed, tasty and somewhat inspired, with the twist of lobster topping each bite. The vegetable panini was good, as well, but just about every other dish that arrived at our table had major issues. 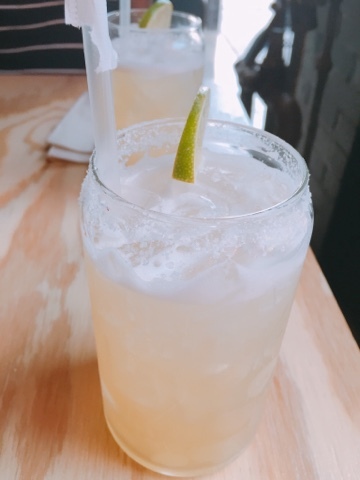 None of it was worth its price, and the overall experience was underwhelming, especially considering that our fun, cheerful waitress kept on leaving dirty dishes at the table as she brought new ones to us. That’s a pet peeve of mine that’s hard to overlook when you consider that this casual dinner for five came to $158.92. I give Riley’s by the River a five on the BHS scale. While the view commanded a high rating and things began so well early in the meal, dinner here is, frankly, not worth what it costs. Diners in Northern New York work too hard for their money to waste it on overcooked, poorly cut steaks, three shrimp drowning in a sea of overcooked pasta, or utterly bland, non-seasoned food. I dislike even more the notion of visitors experiencing a meal like this and thinking this is the best we have to offer when a view of the St. Lawrence is at stake. I hope such hungry travellers, instead, will find their way to Foxy’s in Fisher’s Landing, or the Seaway Grille inside the 1000 Islands Harbor Hotel in Clayton, where they might enjoy a glorious sunset over the river plus a terrific meal. This was an uneven repast, for us, and I find myself frustrated that, despite a couple of decent dishes, I can’t recommend this well-positioned eatery to diners looking for a great dinner with a view. 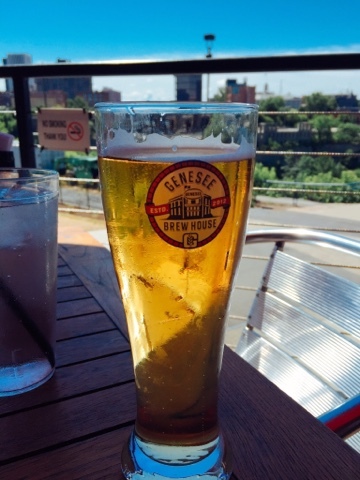 Stop back soon, as I'll have reports from Rochester and Saratoga Springs, plus more from NNY and the Southern Tier right here on the blog. 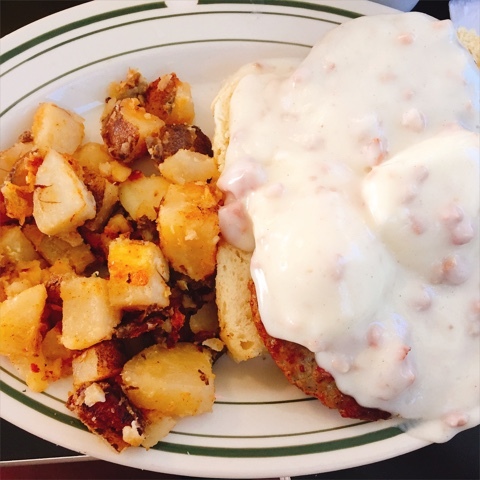 We may no longer have food reviews in the Watertown Daly Times, but I promise not to fail you here! My personality is big; my hunger is bigger! This morning, I received a call from my editor at the Watertown Daily Times that a writer never wants to receive. It's no secret that print media is shrinking (or maybe sinking is a more apt description). People just don't subscribe to newspapers anymore, and most small, regional papers have not figured out how to make online advertising work without the augmentation of subscriptions. And so, I was notified that Big Hungry Shelby, and the Times' Sunday food critique column altogether, has been cancelled, effective immediately. That means the review I spent three hours on yesterday morning will not even be published next week. It means the legacies of former critics Floyd Misek and Walter Siebel have ended with me, without enough notice to give them the proper tribute. 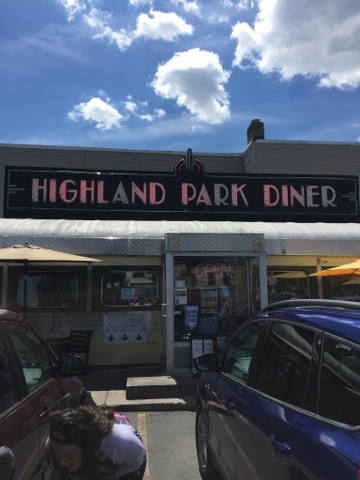 It also means that small, mom and pop restaurants in Northern New York, whose businesses were very often bolstered by the column, and that would struggle to afford direct advertising, will suffer from a lack of exposure. I'm grieving for it all, if I may indulge my more dramatic side for a bit. I knew I probably couldn't carry this gig forever. Living in the Southern Tier and traveling more than two hours north at least once a month to eat nonstop for a weekend, so that I would have enough restaurants to write about week in and week out, was a punishing practice. But I never imagined that my tenure would end with such short notice, nor that the Times was in such circumstances as to have to cut what I was told was one of its top features, from a readership standpoint, with no forewarning. But reviewing restaurants is not a frugal endeavor. Retaining a weekly food critic costs the paper not only a writer's fee, but also reimbursement of the meals and the mileage, and I'm sure that line item loomed large in an organization needing to prioritize news over fluffy food coverage. I'll miss writing my column. I'll miss the comraderie I've started to form with chefs in the region, though I hope to continue those, in some fashion, with the blog. I hope my readers from the paper join me here, where the geographic aperture is wider, but the criticism and zeal for great food remains. But most of all, I'll miss the Times' Sunday food column, be it written by me or anyone else. It's something I've read religiously since I was a little girl, and I think our community will be worse off in its absence. 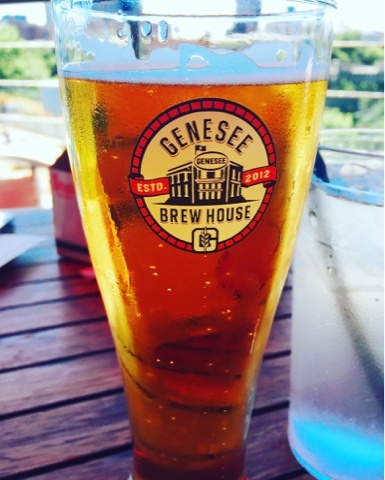 Now that we've lost this weekly peek into the best (and worst) cuisine Northern New York has to offer, I hope the readers don't decamp to chain restaurants. 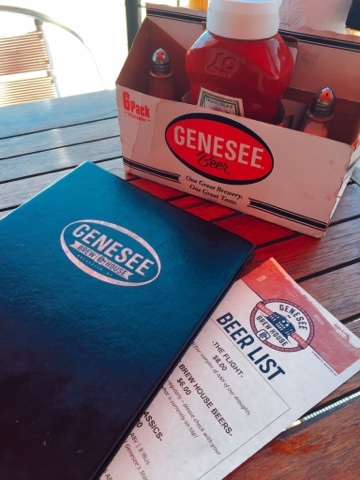 I hope they keep giving locally owned eateries a try. Otherwise, we may have another industry altogether start to sink.